Food fills most of my waking moments in one form or another. I’m either planning ahead what to eat for lunch, or supper, or what to buy. Or I am reading about it. Or, when I can, watching a food related programme. I even dream about food; recipe ideas or food combinations often pop into my sleep world. And some of my most bizarre dreams, I am convinced, are caused as a result of a particular food I have eaten that evening. If I am out, and my family lose me, I am most likely to be found in the nearest deli or cook shop. I adore shopping for food ingredients. I cannot think of a better way to spend a couple of hours than looking at theplethora of food that is on offer on our shelves today; and then spending time in the kitchen, listening to music and preparing our meal. to eat with my family or friends. There are few greater pleasures in life than to spend time around the table eating with friends and family. It is a blessing. How some people can say food is merely for fuel is beyond me. That they eat to live. They are missing the point of life itself, and, simply missing out full stop. We are living in a privileged time and to not appreciate the abundance of food and not relish how central what, and how, we eat is, to who and what we are, is a crime. 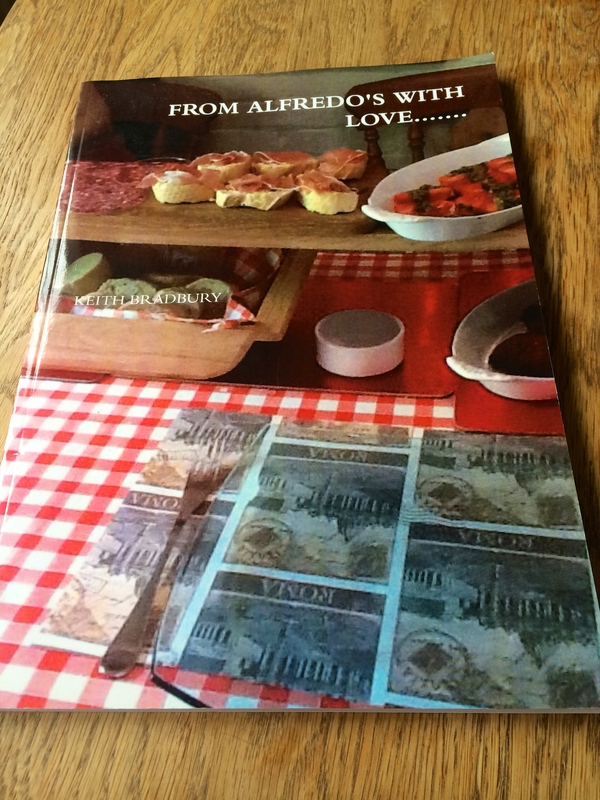 I just want within these pages to share my memories, recipes and passion for all things food. And my passion began as often is the case way back when I was a smallchild. The memories, smells, tastes from my childhood often haunt me and now and then a taste or a smell brings back images from my past. What are my earliest memories? Rusks. Farley’s Rusks without a doubt. That smell. The texture of the rusk as it melted in the warm milk. It is the taste of the nursery. I even returned to them as a student when I left home – they were a cheap source of energy but maybe subconsciously it was a way of hanging onto home life as I moved on. Hmmm. Perhaps too deep! Cutting of apron strings and all that. I associate people from my early days with the food they made or served me. My dad was definitely the best fryer of an egg. He had the ability to get those lovely crispy edges and yet keep the yolk soft. An art in itself! Eggs are one of the miracles of life and rather perversely one of the most vital food substances. My Granddad on my mother’s side, used to eat a raw egg for breakfast every morning. He used to swear by them and he lived until 82. There seems to be a lot of raw food eating in my family history…my mum’s sister, my Aunt Mary used to eat a raw clove of garlic every day and she claimed she never ever had a cold. She also never got married; perhaps the odour of garlic on her breath didn’t help! So, swings and roundabouts. Poached eggs were the one variation of my dad’s that back then I couldn’t face. He did them the proper way- no mickey mouse poaching contraptions – just a faintest dash of vinegar in a milk pan of rolling boiling water, cracking the egg in low over the surface. Pan off the heat. Leave for two minutes. Back then I could not get used to the texture- that amorphous white object always looked to me like some strange creature from the deep – but now they are one of my favourite ways of eating eggs – so you would be proud, Dad! And when I was ill he always produced a dish called ‘pobs’ which was bread soaked in warm milk and sugar. His home made chips were wonderful and he cooked me my first curry. Being a Customs Officer on Manchester Ship canal he often was invited to lunch on board ships crewed by Indians. That began his love of spicy food. This was back in the mid sixties when curry was by no means as omnipresent as it is today. I loved the aroma as a child of the pots of garam masala or the curry powder. Those early Asian aromas awoke my olfactory senses big time and made me aware of a larger world out there. Of course his stories helped. He recounted all the dishes he had been served on the ships – it was like a tale from Ali Baba to me. Bizarrely, the Indian crew ate two or three courses of different appetisers and curry dishes and then tucked into what they were apparently looking forward to the most – a traditional English roast dinner! My dad could never manage that as well. I remember my first attempt at cooking a curry myself when I was about nine or ten and it wasn’t really cooking at all – it was a simple assembling. Vesta Curry was all the rage in the late 60’s early seventies. And it was a remarkably strange flavour. It was a series of pouches and packets that you added to boiling water at different stages. The Vesta Chow Mein was more ambitious as you had to pan fry the noodles – but as far from Asian cooking they could not have been. Still, it was fun at the time. And it made me feel grown up. I think I spotted some Vesta products recently in an Asda. Can’t say I will be reliving the experience any time soon but it was a moment in time. what a lovely blog you have here…. Do you know I also ate Farley’s rusks when growing up…how good it tasted and smelt, dipped in warm milk…and I also drank Ovaltine, my mother loved it. I really can’t say what my first food memory is. Maybe my mum’s chili? Beans on toast? Cheese toastie? We lived on the farm so not much variety but mostly beef, potatoes and veg. I think that is why I am obsessed with food. I get where you are coming from. If I’m not making food, I am dreaming about it or reading about it or foraging for it. My mum poached eggs with one of those horrible pans that take forever to clean. I haven’t mastered the free form poach yet, but I use the silicon cups that are super easy to clean. I love using leftovers in the fridge to create a brand new dish, I heard somewhere that kind of challenge is what makes a good cook. It’s something to aspire to. Thank you for sharing this! It sounds like we are from the same mould! Love your blog and thank you for following mine. childhood memories shape our cooking experiences so much…baking bread with grandpa every Friday afternoon, sitting on the back step popping pea pods fresh from the garden. Sampling his home made wine and screwing up my face! Facination watching him make the most amazing wedding cakes for friends and family, inspiring me to carry on the tradition. My first cookery teacher that recognised my love of cooking and gave me extra lessons, showed me how to bone a chicken and weighed my potato peelings, explaining that her family would have lived on my waste for a week during the war..I don’t know where she came from, Poland maybe..but I think of her everytime I peel a potato as thinly as I can. So many things I cook evoke memories and like you I dream in glorious Foodiecolour so know exactly what you are talking about. That is wonderful..thank you so much for sharing this with me – it is why I blog – to get in touch with others,like you, who feel the same way about food and the experiences surrounding it. Keep in touch! That is very kind of you! I will need sometime to do this but hopefully will get round to it very soon. Thats ok 🙂 It took me a few weeks to get around to it, so it doesn’t matter if you take your time. Glad you’re back and have hit the ground running. I may make that cherry tomato dish soon…my garden is producing them at a rapid rate! While you were gone I was nominated for my very first blog award. I’d like to pass on the love to you…because I love reading your blog! Wow, that is so nice of you and lovely words too on your blog – what do I do now?? Hey, thank you soooo much! When I get a few minutes to spare this weekend I will get on to this! Cheers again, Fae! Appreciated! Fae’s Nominations led me here. You showcase food which I can see myself cooking and that’s what makes your blog enjoyable. That and the content is very creatively witty too. Thank you so much! And thank you for following! Makes it all worthwhile. Love the look of your blog and will take time later to give it a good read. and very well deserved Keith..I love your blog and its lovely you have recognition with an Award win…congratulation! keith, i’ll be frank. i love your blog. i sort of randomly stumbled upon it while looking for some really awesome food blogs, and i am super glad that i did. first, the nonchalance in your writing is amazing. when i read your posts about dinner parties, it doesn’t seem like you are stressed. it seems like you are playing, and you just happened to be in a kitchen. second, your plating is to die for. i’m trying to train myself to be better at plating, and your blog is truly an inspriation in that regard. keep up the excellent work, and i’ll keep stopping by to see what you are up to. You are very kind and you have made my day – lovely to get out of bed and read such compliments – makes it all worthwhile. Thank you, Misha. Have just read some of your blog and will certainly revisit later. Have a wonderful day. Great world this blogworld! Pleased to have discovered yours too! Have a great week! Hello Keith. Nice to find your blog this morning! I can see I have a lot of catching up to do! You have a plethora of wonderful recipes and looking forward to looking through them. Thank you for following my blog and “nice to meet you”! It is a pleasure and thank you for visiting…. and your kind words! Makes it all worthwhile! I discovered your blog on a whim and connected right away. I’m enjoying reading your posts, thanks. I am so glad you found my blog! Great to have a fellow Lancastrian along! Hope you follow me! Love from across the pond!